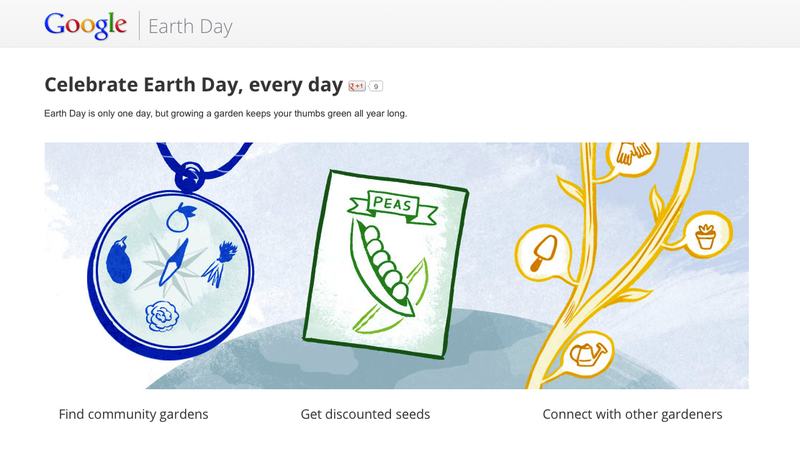 To help you start a garden of your own, we’ve put together an Earth Day resource page. 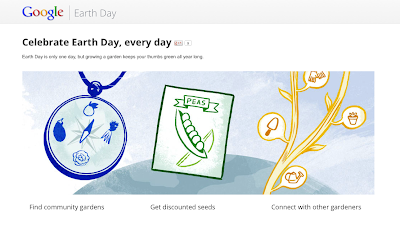 Explore community gardens and farmers’ markets on our interactive map, get discounted seeds to plant flowers, herbs and vegetables in your own backyard and connect with other gardeners for planting tips and inspiration. We hope you find these resources useful and enjoy gardening as much as we do. 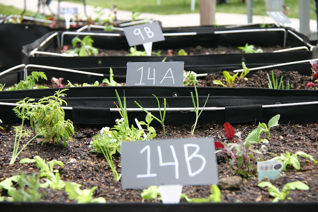 On our Mountain View, Calif. campus, we have community gardens where Googlers can grow and harvest their choice of herbs and vegetables. Company-wide, we focus on getting organic, locally-grown produce for our cafes. We purchase food directly from farms near our campuses, and learn about how our suppliers raise, farm and harvest their food—all to ensure that we’re eating sustainably and being good to the environment. Last week we unveiled this year’s Zeitgeist, including the fastest rising searches in 2011. Those of us on the Google Green team were pleased that the search trends include several popular searches related to the environment (as you can see from the highlights video). 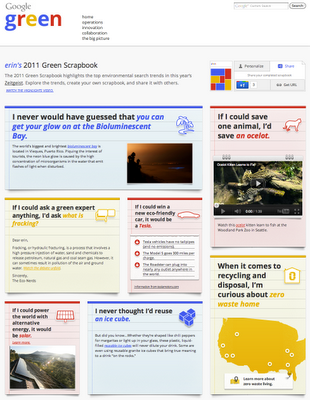 So we created the Green Scrapbook to help you explore these green trends, choose your favorites, and reveal videos and surprising facts about them. As you click around, you create your very own collection of what green meant to you this year, which you can personalize with your name and share with your friends. People have already started creating and sharing their Green Scrapbook. For example, Adam created one showcasing a video of a tapir (Belize’s endangered “mountain cow”) and highlighting what an LED light is. I created my scrapbook, too, where I could tell people about the microorganisms that light up Puerto Rico’s famous “bioluminescent bay.” I also let people know that if I could win an eco-friendly car, I’d choose a Tesla (there’s still time to get me one for Christmas!). Once you complete your own scrapbook, you can share it on Google+ or anywhere you’d like by grabbing the unique URL to your scrapbook with the “get URL” link at the top right. We’re working hard to create a better web that’s also better for the environment. We hope the Green Scrapbook sparks conversation and gets people thinking about all the ways they can make greener choices in their lives—whether it’s about the merits of rooftop [solar energy], or prompting people to think about [garbage islands] and then reach for a [reusable water bottle].